only special people will get these ones on their postcards! :) i have received one in the past. Great choice for today. Interesting - we spent time in the Alberta Badlands on our recent Canadian trip and found it fascinating. for some reason, we didn't include the badlands in our trip when I was 10. I probably had no say in the matter. ...kids would love these dinosaurs. Wow you wouldn't want those teeth coming into your eye line. Visually striking images, they will look great on an envelope. Dinosaurs are wonderfully scary creatures. and thankfully extinct! Dino of course, is a perfect choice for D.
What a great idea. 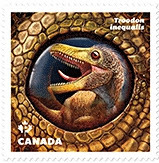 Canadian stamps have great artwork. These may be my all-time favorite stamps.